Beach in Sihanoukville. Many misfit expats live here, some are hiding from the law. Chris is a twenty-something from England, with beard stubble, and a dark t-shirt. I met this friendly Brit one night at a no-name bar in Sihanoukville, where he worked as a bartender. He doesn't earn much, Chris only gets six dollars a day for eight hours of night time work. “Slave labor,” he tells me. But he does get a free meal every night, and free drinks. “I’m a bit of an alcoholic,” he admits to me. Like many young folk I've met in Asia, Chris has been traveling around for months, and stopped to work in Cambodia for a while. I asked him if he had ever been to the states during his travels. His response wasn't what I was expecting. “They won’t give me a visa,” Chris said, “since I was convicted of production of cannabis.” Apparently Chris has a hippie side to him, which got him in trouble with the UK police a few years back. While we're chatting in this beach side hang out, a grungy, older Aussie that Chris knows walks into the bar. I’d seen this shabby guy yesterday on the street. He’d asked me for a cigarette, but I don't smoke. The Australian asks Chris, “You want to buy some weed? Two dollars a bag? I have to pay my hotel bill,” he explains. Chris declines, since he doesn’t do drug transactions while he's working. I also decline, since I stick to beer. Obviously the Aussie was in dire straits; he looked like a transient. He probably won’t sell marijuana for long here either, since local pushers won’t like him competing for their business. Checking out the Aussie, I notice a large infected cut on the back of his hand. It was so infected, that his whole hand was swelled up. I figured he must have injured it in a motorbike accident, the usual way that foreigners get injured in Cambodia. But I was wrong. “A whore cut him”, Chris told me, after the Aussie walked away. Apparently since the Aussie didn’t have money for rent, he didn't have money to pay a prostitute that he took home either. Chris and the old Aussie are just two of the down-and-out examples, that make up the soap opera scene of foreigners living in Sihanoukville. Long time expatriates call the town ‘Snookville’ or just ‘Snook’, for short. During my days checking out the beach, I learn that there are many expats hanging out here with skeletons in their closets. One night out at a restaurant with a group of foreigners, I was introduced to a German lawyer. I don’t recall his name, but it was probably an alias. That's likely, since I was told that this tall Aryan looking guy, was wanted for murder back in Germany! I already met a Swede in Phnom Penh who was hiding out from the law, but he was a peaceful guy, wanted only for media piracy. Could it be that this tall German with thinning hair, was really a killer? I noticed the German had a scar to one side of his forehead; an intimidating looking fellow. I wonder, just how did he got that scar?? I’m sitting at the controls of a Russian aircraft. It's an older two engine, Antonov 24 airplane. I reach for a gauge on the control panel, and the knob comes off in my hand! Obviously, this plane has seen better days and fortunately, I'm not airborne. In fact, I'm not even in a real airport. But I am in a disco in Sihanoukville that is named 'Airport', and this plane is parked right over the middle of the dance floor below me! How weird. I peer out the cockpit windows, where the building housing this night spot resembles an old airport hanger. Adding to the odd ambiance, old photos with advertisements from long gone airlines line the walls. I can see the need to stand out in Sihanoukville's night life, but this is just unreal. I leave the cockpit to go aft inside the plane, and find the passenger compartment in total disarray. The seats have been removed; it's dusty and grubby. Apparently this old plane is still being renovated for the club. I imagine they'll add more tables and chairs before it’s finished. It's fitting that an old Soviet plane is parked in here, because this strange disco is owned by Russians. Of course that helps the disco to attract a Russia clientele, but not tonight. I exit the plane and descend down to the dance floor, into a disco that's nearly empty. It's the off season, so fewer Russians are flying down from Siberia to Cambodia while I'm staying here. With the house music blaring, I finish my beer, and head for the door. 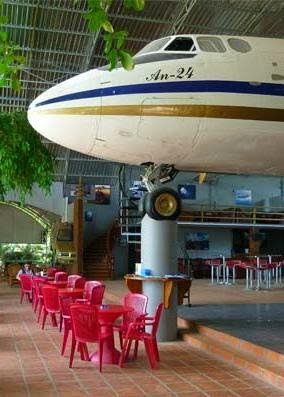 This plane is yet another foreign misfit in Cambodia.